Looking for the next big fintech conference or even a small fintech meetup to attend? 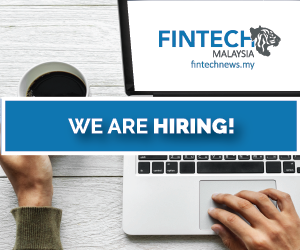 Check out our list of Fintech events to attend in Malaysia – Updated regularly! The course is designed to support risk professionals, anti-money laundering, laundering professionals and VC industry practitioners in understanding more about the development of (VA) and how to manage associated financial crime risks. From Europe to Asia. 20 countries. 1 mission. We have visited 19 countries across Europe and Asia with a mission to champion a standardised Blockchain technology adoption for Sustainable Development Goals (SDGs). 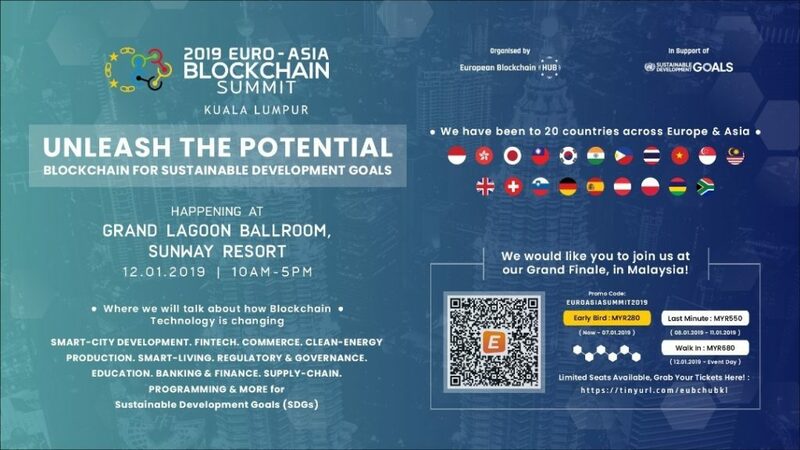 And now, this January 2019, we will be in Kuala Lumpur, Malaysia – our 20th country as we hold the grand finale of our global Blockchain for Sustainable Development Goals (SDGs) Tour Summit! Join us as we bring you featured speakers from Europe and Asia; all who are Blockchain experts and pioneers from a diversity of organisations under one big roof in Sunway Resort! Seize this chance to meet and exchange Blockchain-related knowledge and get yourself updated with the latest Blockchain trends and news! The 6th edition EmTech Asia, held from 22 – 23 January 2018 in Marina Bay Sands Expo and Convention Centre, is jointly organized by Koelnmesse and MIT Technology Review. EmTech is where technology, business and culture converge. At EmTech Asia, you will meet the innovators, the scientists, the investors and the tech executives at the heart of the next technology revolution. Throughout two exhilarating days of networking and learning, you will get inspired from 40 speakers and amazed by the ingenuity of the 10 innovators under 35 and 1,000 participants who are leaders in their field. If you are passionate about turning ideas into innovative solutions and addressing major global issues, join us for two days of intelligent conversation at EmTech Asia, on 22 - 23 January 2019. FinTech News Singapore and Hong Kong’s subscribers are eligible for a 10% discount off the ticket prices. Click here to register and enter the FinTech News discount code ETA19FinTechNews at check-out to enjoy the 10% discount. 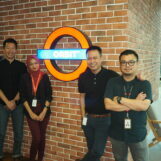 The event will be held on March 23 at The Orbit, Bangsar South. Find out more here. 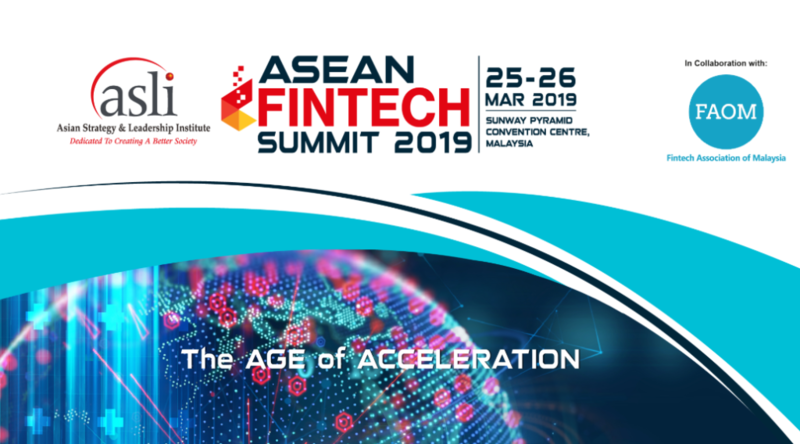 ASLI stands for the Asian Strategy & Leadership Institute, and they hold the ASEAN Fintech Summit in collaboration with the Fintech Association of Malaysia. For 2019, the summit focuses on the theme “Age of Acceleration”, which aims to present in-depth and multi-dimensional discussions about talent, funding, digital implementation, branding and environmental perspectives. Seakers will be hailing from policy makes, academicians, to individual experts in their field. The summit will be held in March 25 – 26 at the Sunway Pyramid Convention Center. Find out more here. 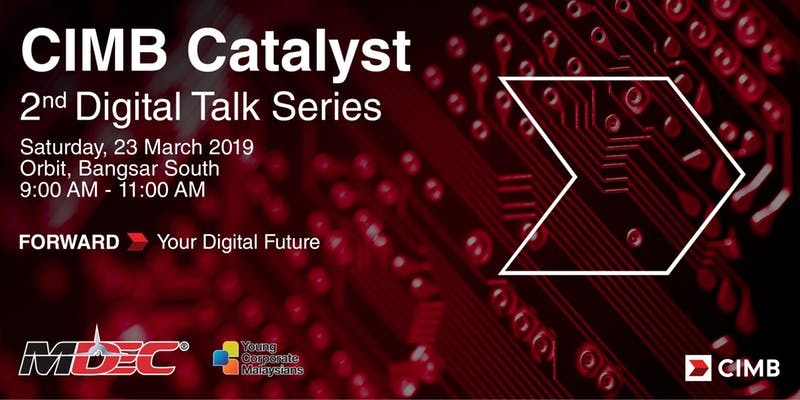 A collaboration between the Blockchain Academy and the Fintech Association of Malaysia, this 3-hour session by the co-founder of Blockchain Academy Malaysia wants to explain what fintechs need to know about blockchain, beyond the hype, and exactly how it can be utilised to grow one’s fintech business. This will be a relaxed casual session. The session will be held on March 28 in The Orbit, Bangsar South. Find out more here. Hosted by IFN Fintech, The Asian Islamic Fintech Huddle is an international gathering of industry influencers and fintech visionaries using technology to drive financial inclusion in a Shariah-compliant and ethical manner. The event will feature a series of panel discussions, demo session and networking events with a goal of connecting all stakeholders of the Islamic fintech ecosystem. This includes startups, investors, policymakers and intermediaries. The huddle will be held on April 25, in Kuala Lumpur. Find out more here. The Financial Services Summit is a by-invitation only forum by FST Media. Targeted at bankers, insurers and technology leaders the event will dive into subjects like; CX, data, digital transformation, cloud, RPA, fintech, regtech and many more. The event will be held on April 25th, St Regis, Kuala Lumpur. Find out more here. This year, the event seems to brand itself as the Bloconomic Excellence Award 2019, though it will still entail a main conference, leaders panel session, and mini exhibition shows with participation from a thousand delegates from government, associations, research institutes, financial institution as well as fintech and internet finance companies, Blockchain technology and industry application companies, cryptocurrency and digital asset related companies. Bloconomic Excellence Award discusses the real use cases and the future prospect of Blockchain in the new reality of blockchain landscape as well as addressing the opportunities and challenges ahead. The summit will be held on the 25 – 26 April in Le Meridien Putrajaya. Find out more here. Techstars Startup Weekends are 54-hour events designed to provide experiential education for technical and non-technical entrepreneurs. Beginning with Friday night pitches and continuing through brainstorming, business plan development, and basic prototype creation, Techstars Startup Weekends culminate in Sunday night demos and presentations. The event will be held on April 26 – 28, in APU New Campus, Kuala Lumpur. Find out more here. 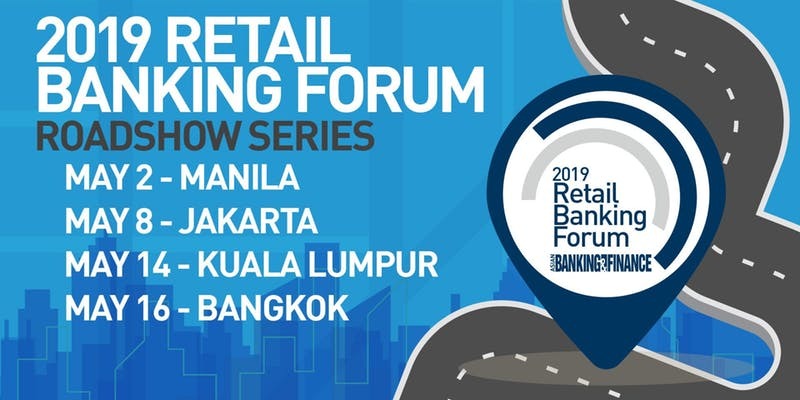 The Asia Banking & Finance Retail Banking Forum is held in 4 cities, Manila, Jakarta, Kuala Lumpur, and Bangkok. The Malaysian forum in 2018 was attended by key executives from Maybank, CIMB, Public Bank Berhad, RHB Bank Berhad, AmBank, Affin Bank, Bank Islam Malaysia, and Standard Chartered Malaysia amongst others. The event will be held on May 14, in Kuala Lumpur. Find out more here. Join us at Cloud Expo Asia, Hong Kong, co-located with Cloud & Cyber Security Expo, Big Data World, Smart IoT, as well as Data Centre World, on 22-23 May 2019 at HKCEC, you’ll be sourcing from 280+ leading suppliers, inspired by 300+ prominent industry experts from 10+ conference theatres, and network with 12,000+ IT professionals at ONE location, across TWO days! 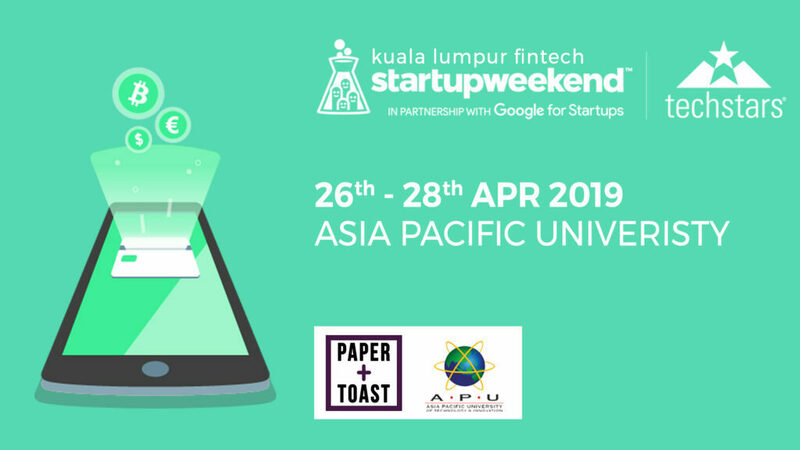 Bank Negara Malaysia (BNM) will host Malaysia Fintech Week 2019, the first flagship event by the regulator focusing on fintech and tech transformation of financial services in Malaysia. The week will be held as part of the Malaysia Tech Week. The event is expected to convene participants from across the fintech ecosystem including innovators, investors, policy-makers, academia, fintech influencers and industry leaders in the fields of finance, banking and technology to explore the opportunities and challenges in harnessing fintech innovations to shape the future of the financial services industry. The event will be held in June 17 – 21, at Sasana Kijang and the Orbit. Further details to be announced. This year will be the second edition of the Global Islamic FinTech Summit, a conference to address and highlight latest trends in Islamic fintech, while also seeking to become a platform for thought leaders to come together to share ideas and plot the best direction for the industry to go next. The summit will be held in September 23 – 25 in Kuala Lumpur. Find out more here.